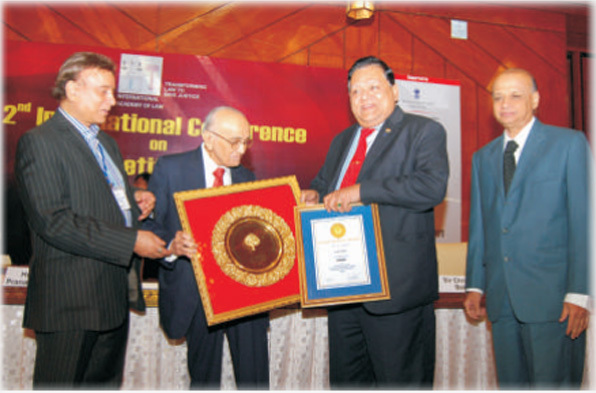 Shri A M Naik, Chairman, Larsen & Toubro receiving the ‘Golden Peacock Life Time Achievement Award for Business Leadership’ for the year 2010. Shri A. M. Naik is the Chairman of Larsen & Toubro, a company he joined in 1965 which has actually grown with him from a medium size Indian enterprise, Today L&T is transformed into a global conglomerate. L&T is recognized as one of world’s most admired engineering companies. He is a structural engineer with a difference. He has restructured L&T, aimed at enhancing shareholder value. His emphasis on HR and quality as the twin engines of growth have yieled significant results. He is a true revolutionary. He spearheaded the move to de-merge L&T’s cement business. Shri Naik’s twin agenda of ethical value & triple bottom line approach has an unbeatable record. He has earlier been awarded Padma Bhushan, by the President of India Leader of the year Award from Economic times, E&Y Entrepreneur Award, and JRD Tata Corporate Leadership Award from the All India Management Association.